So, armed with a headful of newly acquired knowledge I began my quest to make the perfect pop cake first time round. I can't share my cake pops with you but I can share how to make them. First gather your ingredients. I am making two different flavours of cake pops. Some with a ginger and chocolate centre dipped in milk chocolate and others with a boozy lemon and vanilla centre dipped in white chocolate. 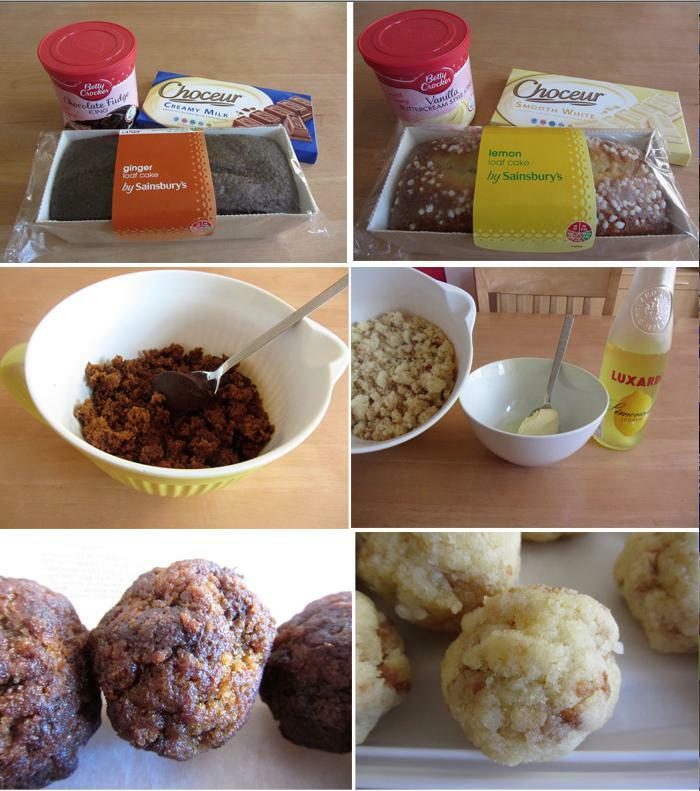 The photographs (to follow) show you the ingredients I used, as you will see the cake and the frosting is preprepared. This is because I learned that there is absolutely no difference in taste or quality of the finished product whether you use home made or shop bought ingredients. I usually prefer home made but not if I feel like i'm wasting time and effort. The chocolate is from Lidl. 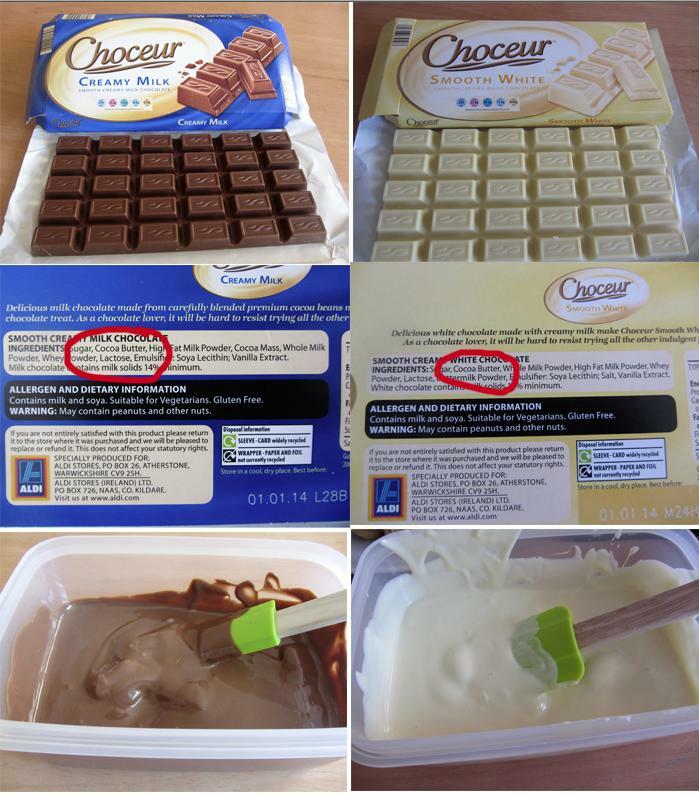 Lidl chocolate is raved about because of it's high cocoa butter content and low price. The cakes cost £1 each, as did the bars of chocolate. The ready made frosting is more expensive at just over £2 a tub but not much is needed and it keeps in the fridge for one month. The first stage is to crumble the cake. The cakes I used were very moist so I more 'broke' than crumbled but as it turned out this was of benefit later. Then I added roughly one desert spoon of frosting, I added these in little dabs because it was easier to mix. It doesn't look like much compared to the amount of cake but too much and the filling becomes too heavy, you need to retain the lightless of the cake. I added a little lemon booze to the lemony cake but this is personal preference. When mixing don't squizh the mixture tight or it'll end up like someones already chewed the cake for you, you need to still be able to see the individual pieces. It will all come together by following the next steps. When making the balls the secret seems to be again to not squidge the mixture, instead take a slack palm full of the loose mix and act as though you're repeatedly passing a hot egg from one hand to the other, the balls will form of their own accord after about a dozen or so passes. Place these balls on some greaseproof paper and pop them in the freezer. After about 30 or so minutes the balls will be ready to coat. I heard about a product called Candy Melts but they charge £4 for a packet of chocolate drops that coats around a dozen cake pops. 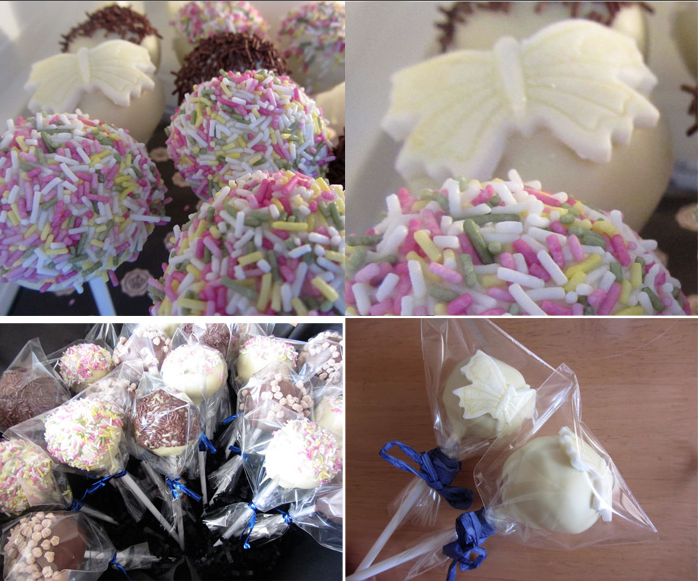 I wanted to make cake pops and offer them out like sweets, I couldn't do that if I was having to spend a fortune. So, I researched how to make shop bought chocolate work. It seems that chocolate is a bit of an unstable substance, it behaves differently under different temperatures. I learned that what I needed to use was something called 'tempered' chocolate. I won't go into huge detail but basically if chocolate is tempered correctly it will harden at room temperature. If it is not tempered or goes out of temper it will never harden. Shop bought chocolate that contains only cocoa butter (not vegetable oil or owt daft like that) is already in temper. Long story short, you will take it out of temper if it is heated too hot. You can either piss around with thermometers raising and lowering the temperature or you can do it the easy way, which is only heat the chocolate till it melts, that way you keep it in a state of temper. I used the microwave to avoid any contact with moisture (as this ruins chocolate). For the milk chocolate it took two 30 second blasts, for the white two 20 second blasts. Important to stir with a plastic spatula or spoon as metal can affect the temperature, wood can have hidden moisture. You can see by the pictures that I stopped heating the chocolate before it had completely melted, there were still about five semi melted blobs these can be fished out or stirred in but it guaranteed I had not heated it too much. It is important to semi freeze the balls for two reasons. One is that when they come into contact with the chocolate they help it to harden quickly and the other is the cake ball should not be tight (as discussed earlier) but because it is frozen it is temporarily hard enough to stay on the stick and not fall off. It helps if the stick is dipped into the melted chocolate before it is inserted. Once all the sticks are in place the fun can start. I transferred the milk chocolate into a tall sided glass but didn't bother for the white chocolate, for the white I simply tipped the chocolate to the edge of the plastic tub. I preferred the second method as I found the glass interfered with the temperature of the chocolate and just those few degrees cooler cause the chocolate to thicken up, this did not spoil the effect but it meant it did not cover all my balls. I found that the chocolate set that quickly that I had to dipped them in sprinkles once the chocolate had stopped dripping. I thought I might have time to coat them all then use a topping but I would not have had chance. Once dipped and decorated I placed the cake pops in the fridge for a while, about 30 minutes. I believe that putting chocolate in the fridge can cause it to bloom but it is so hot in the kitchen (because of the weather) that I didn't want to risk them spoiling completely. Plus, they're pretty much covered in sprinkles so no one will see evidence of blooming even if it were to happen. Blooming is not some sort of horrid bacteria or anything, it's basically fat from the chocolate rising to the surface and it can give the appearance of a kind of white shadow, it is totally harmless though. * As a test I attempted to dip two cake balls that had not been frozen into some left over white chocolate. It made a right holy mess. They would not twirl once dipped, instead the weight of the chocolate cause them to split in two and they fell off the stick. So, very important to freeze your balls and don't let that chocolate get hot. 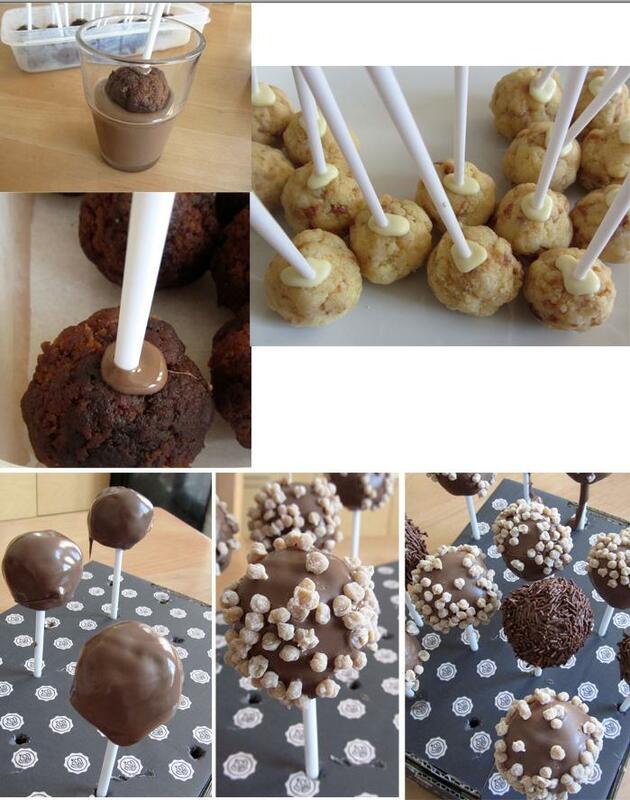 I hope you like my cake pops and I hope i've given you a few tips on how to make them easily for yourselves.